On 25 May the new chairpersons and deputy chairpersons were appointed to the statutory committees via d’Hondt. Paula Bradley, who previously was vice chair of the committee, has been appointed as chair, while Gary Middleton has been appointed as vice chair. The Stormont Committee for Health was established to advise and assist the Minister, while scrutinising, developing policy and consulting with the Department of Health. The committee plays a key role in the consideration and development of legislation. The committee will next meet in mid-September for a briefing by Professor Bengoa on the Transformation of Health and Social Care Report. Other roles: Assembly Party Group Chairperson: All Party Group on Sexual Health; All Party Group on UNSCR 1325 Women, Peace and Security Assembly Party Group member: All Party Group on Sexual Health; All Party Group on Tackling Educational Underachievement And Promoting Educational Excellence For All; All Party Group on Congenital Heart Disease; All Party Group on Cancer. Other roles: Assembly Party Group Vice-Chairperson: All Party Group on Suicide Prevention. Assembly Party Group Treasurer: All Party Group on Sexual Health. Assembly Party Group member: All Party Group on Congenital Heart Disease; All Party Group on Epilepsy; All Party Group on Multiple Sclerosis; All Party Group on Autism. Other roles: Committee member: Committee on Standards and Privileges. Assembly Party Group Member: All Party Group on Cycling; All Party Group on Sexual Health; All Party Group on UNSCR 1325 Women, Peace and Security. Other roles: Committee member: Public Accounts Committee and Business Committee. Assembly Party Group Member: All Party Group on Construction. Other roles: Committee member: Committee for Justice. Assembly Party Group Member: All Party Group on Housing and All Party Group on International Development. Other Roles: Committee member: Public Accounts Committee. Assembly Party Group Vice-Chairperson: All Party Group on Ageing and Older People. Assembly Party Group Secretary: All Party Group on Mental Health; All Party Group on Suicide Prevention. Assembly Party Group Member: All Party Group on Housing; All Party Group on Sexual Health; All Party Group on Disability; All Party Group on Congenital Heart Disease; All Party Group on Cancer. Other roles: Committee member: Audit Committee. Assembly Party Group Chairperson: All Party Group on Disability; All Party Group on Cancer. Assembly Party Group Secretary: All Party Group on Congenital Heart Disease. 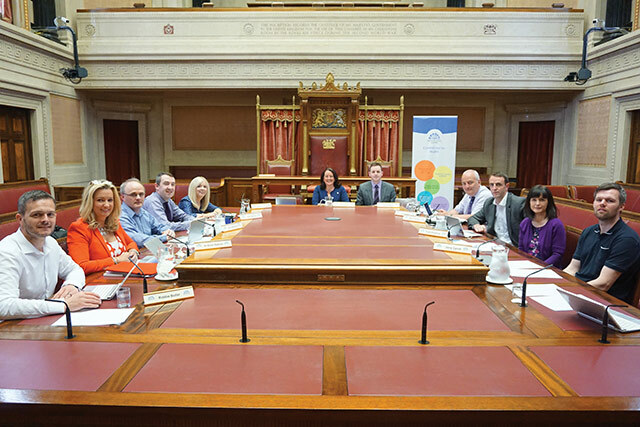 Assembly Party Group Treasurer: All Party Group on Social Enterprise. Assembly Party Group Member: All Party Group on Cycling; All Party Group on Ageing and Older People; All Party Group on Sexual Health; All Party Group on Multiple Sclerosis; All Party Group on Science and Technology; All Party Group on Epilepsy. Other roles: Assembly Party Group Chairperson: All Party Group on Muscular Dystrophy; All Party Group on Mental Health. Assembly Party Group Treasurer: All Party Group on Suicide Prevention; All Party Group on Disability; All Party Group on Congenital Heart Disease; All Party Group on Multiple Sclerosis. Assembly Party Group Member: All Party Group on Ageing and Older People; All Party Group on Cycling; All Party Group on Cancer; All Party Group on Autism. Other Roles: Committee member: Committee on Standards and Privileges. Assembly Party Group Secretary: All Party Group on Muscular Dystrophy; All Party Group on Multiple Sclerosis; All Party Group on Cancer. Assembly Party Group Member: All Party Group on Mental Health; All Party Group on Suicide Prevention; All Party Group on Sexual Health; All Party Group on Congenital Heart Disease; All Party Group on Epilepsy.